A reproduction of the Sovereigns’ Colour carried by the 137th Battalion, Canadian Expeditionary Force, during the First World War is unveiled at the Kings’ Own Gallery, at The Military Museum, Calgary. This flag symbolises the contribution made by the 137th Battalion, a hundred years ago. Regimental flags or colours are the focal point of loyalty, spirit, and tradition of a regiment. Before being presented, Colours are always consecrated at a religious ceremony. Customarily, when a Regimental Colour was too old to be used, or no longer required it was hung in a church. Today it is more common for them to be given to a museum for long term care. 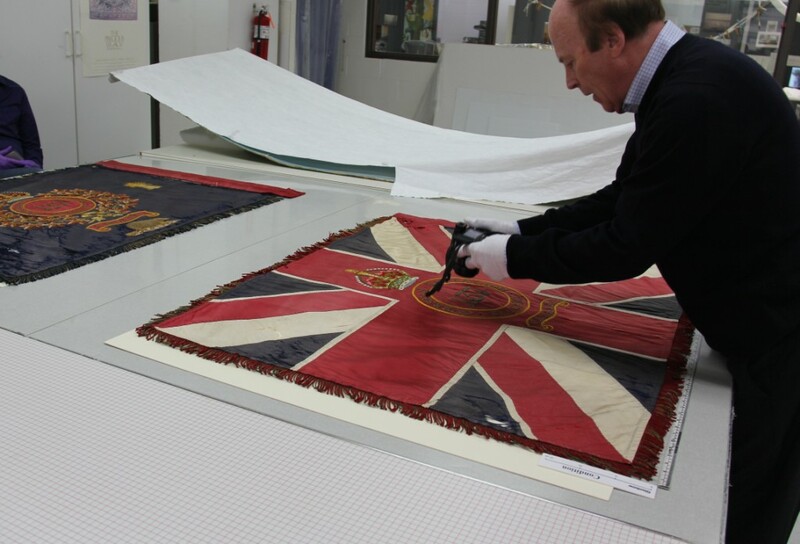 The 137th Battalion Regimental Colour is deposited at the Glenbow Museum. 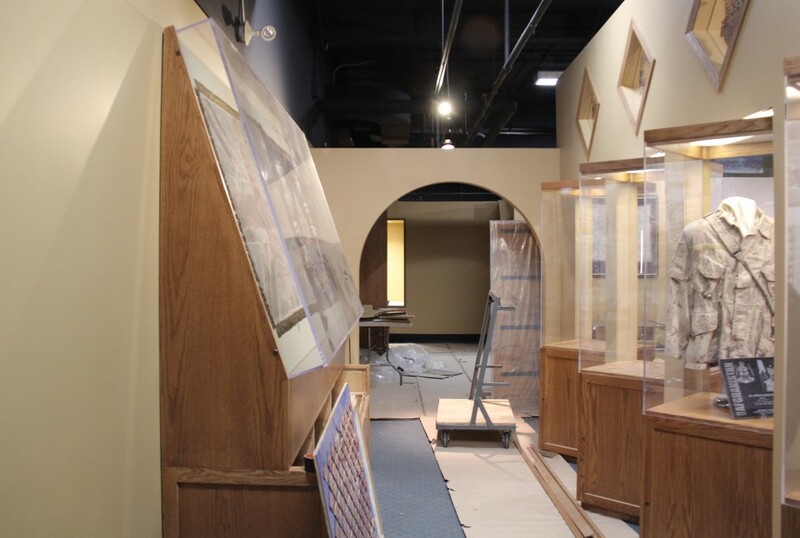 Restoration of the Kings’ Own Gallery at The Military Museum called for a display signifying the contribution of the 137th Battalion. A reproduction of the Sovereigns’ Colour was thought appropriate. As with conservation work, before beginning, we documented the original Colour with photographs, diagrams, and a written report giving detailed information on materials and construction. A full-size maquette was prepared of the Colour and its intricate embroidery. Reproducing the Sovereigns’ Colour was realised entirely by hand, using the same quality hand-cut silk fabrics and threads utilised for the original. The royal crown and emblazon of Battle Honours was hand-embroidered on both sides in coloured silk and gold bullion, and similarly fringed. This project for the Kings’ Own Calgary Regiment has given us access to a treasure trove of textiles, embroiderers, and gold lace suppliers. We have to look now at designing a display case, and how to mount the Colour for exhibition in the newly restored Gallery. Mounts, of course, should respond to the needs of the object as well as the aesthetic of the exhibition. 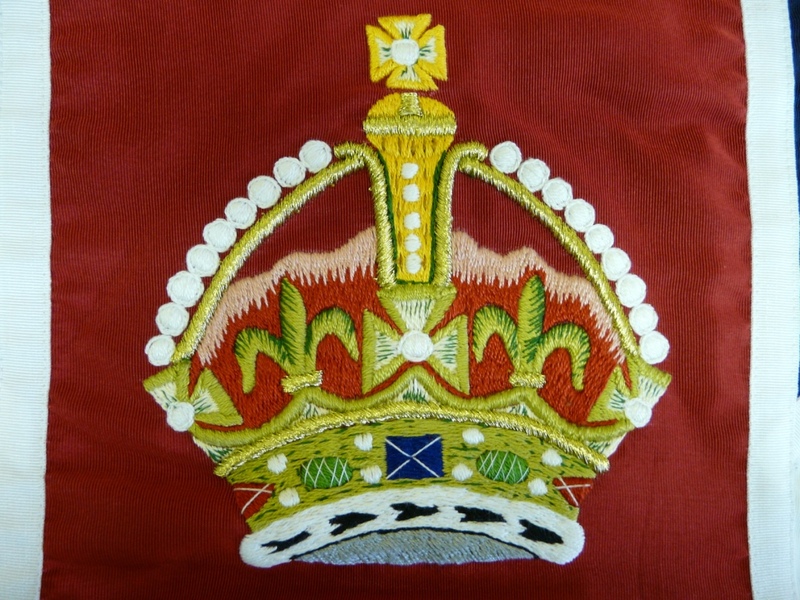 Textiles, such as Regimental Colours, are very high maintenance. Words like sympathetic come to mind, they must never be stressed, and should be well supported and comfortable. The King’s Own Calgary Regiment traces its origin to the 103rd Regiment, Calgary Rifles raised on 10 April 1910 at Calgary, Alberta. The regiment remained an Active Militia unit during the 1914-1918 War and raised several battalions for the Canadian Expeditionary Force (CEF) between 1914 and 1919, including the 137th Battalion.